New in version 1.6: This feature is available since Weblate 1.6. By default, everyone can add suggestions, which logged in users can accept. Requiring more then one person for acceptance can be achieved by suggestion voting. You can enable this on Component configuration configuration by Suggestion voting and Autoaccept suggestions. The first one enables the voting feature, while the latter sets the threshold a suggestion is automatically is accepted (this includes a vote from the user making the suggestion). 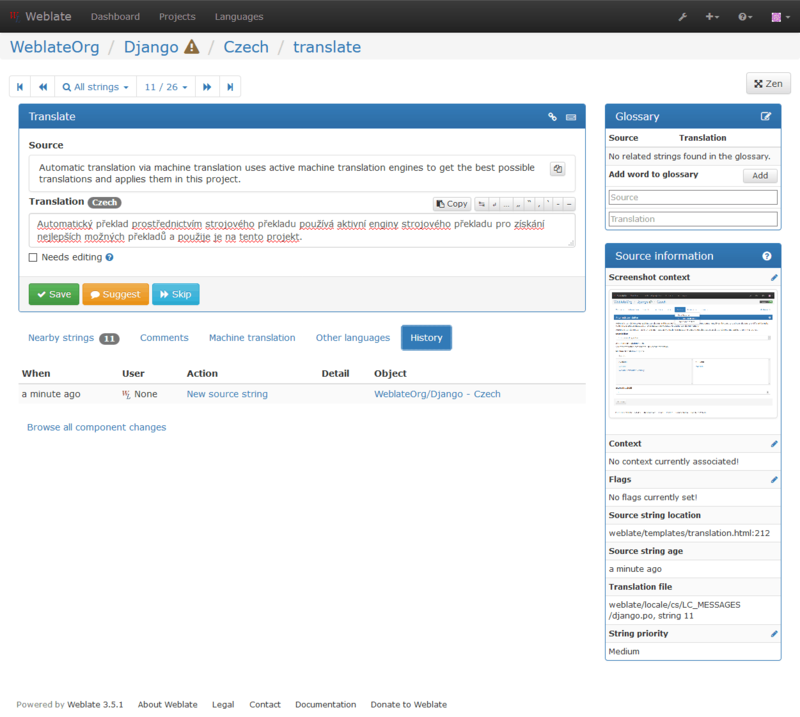 Once automatic acceptance is set up, normal users lose the privilege to directly save translations or accept suggestions. This can be overridden by Can override suggestion state privilege (see Access control). Users suggest and vote for suggestions, a limited group controls what is accepted - turn on voting, but automatic acceptance off, and don’t let users save translations. Users suggest and vote for suggestions with automatical acceptance once the defined number of them agree - turn on voting and set the desired number of votes for automatic acceptance. 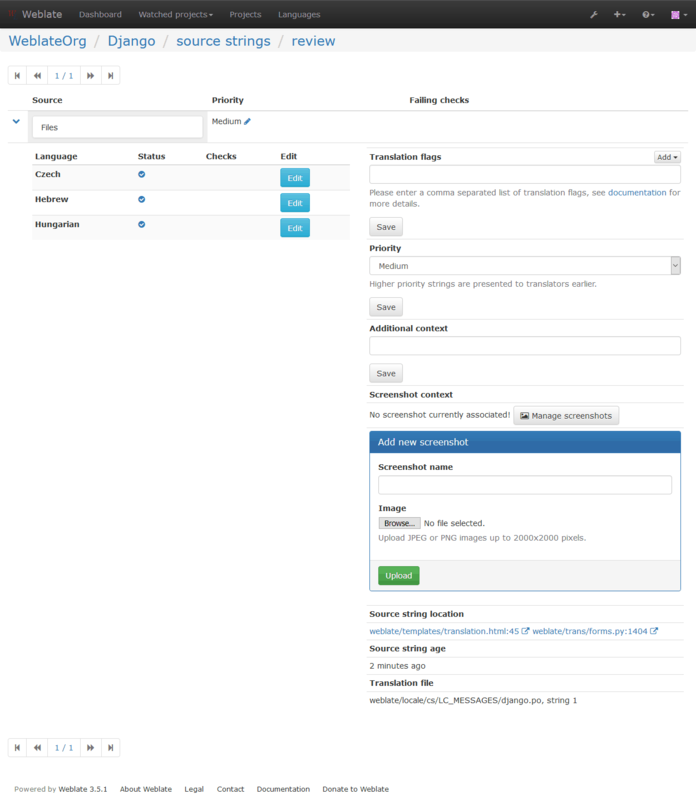 Optional voting for suggestions - you can also turn on voting only, and in this case it can optionally be used by users when they are unsure about a translation by making multiple suggestions. You can change string priority, strings with higher priority are offered first for translation. This can be useful for prioritizing translation of strings which are seen first by users or are otherwise important. Changed in version 3.3: Previously this was called Quality checks flags, but as it no longer configures only checks, the name was changed to be more generic. 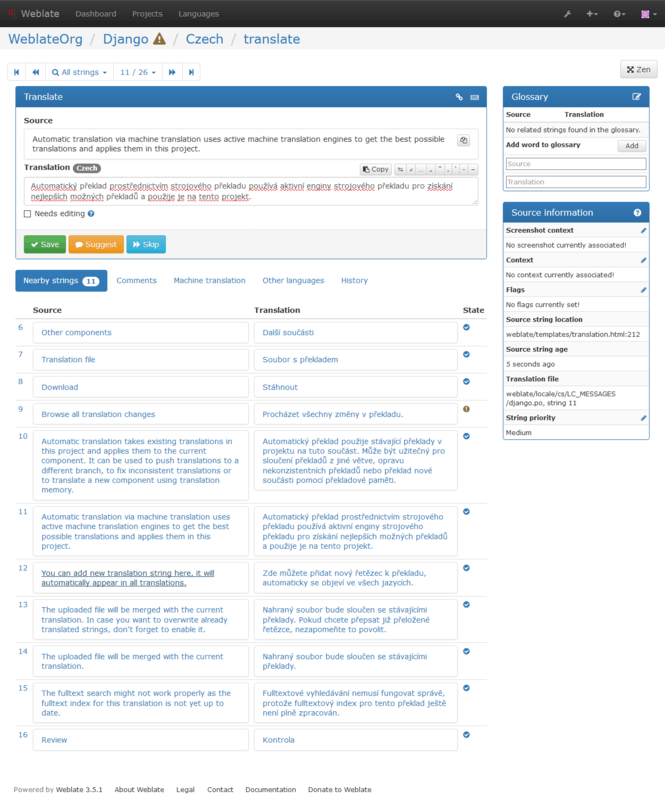 The default set of translation flags is determined by the translation Component configuration and the translation file. However, you might want to use it to customize this per source string. You can upload a screenshot showing a given source string in use within your program. This helps translators understand where it is used, and how it should be translated. In addition to Reviewing source strings, screenshots have a separate management interface under Tools menu. 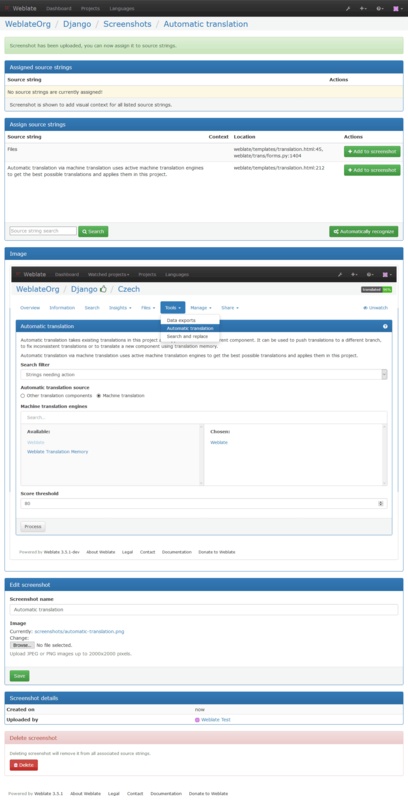 Upload screenshots, assign them to source strings manually or with the use of OCR.